A Vehicle Identification Number, or VIN, is a unique number assigned to every motor vehicle. A VIN lookup can be accomplished using several different methods, and can help owners, law enforcement officers and state DMVs ensure that the vehicles on U.S. roads remain safe and legal. The best way to request a VIN number lookup report depends on a car owner’s individual needs and preferences. The quickest and simplest way to perform a VIN code lookup is to order one online. 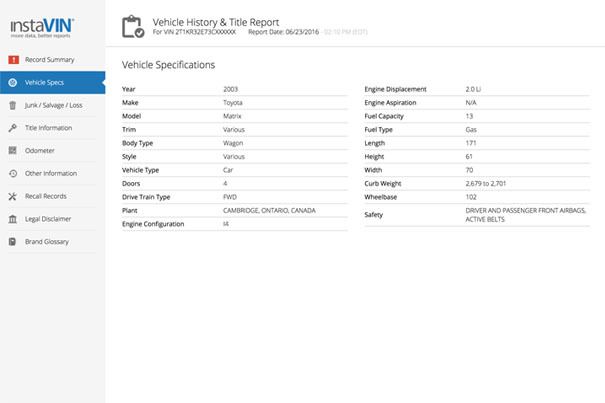 Your online VIN number check report will provide you with the latest and most comprehensive information available about your vehicle. It will show your vehicle’s specifications, title history, applicable safety recalls and important car accident and auto insurance claim data. Reports are available for cars, trucks, motorcycles, recreational vehicles, and even commercial vehicles, such as trucks or buses. Checking VIN numbers online can spare you the lines and wait times typically associated with ordering a report through other methods. If you don’t mind the inconvenience of a trip to the DMV, you can also look up VIN number information by requesting a report from your state’s Department of Motor Vehicles. Looking up a VIN number is not something all DMV offices in all states will be prepared or equipped to do, however. If you decide to visit the DMV rather than order a VIN number report online, you will need to contact your local DMV office in advance. In addition to inquiring about how to check a VIN number using your state’s standard process, you will need to find out what forms of payment your DMV office of choice accepts, and what documentation your state requires to initiate such a request. In some states, you may be able to order a VIN history report by phone from your state’s Department of Motor Vehicles. This option will not be available in all states. You will need to have a credit or debit card available for payment when calling, and should be prepared to provide identifying information to the DMV representative at the time of the call. 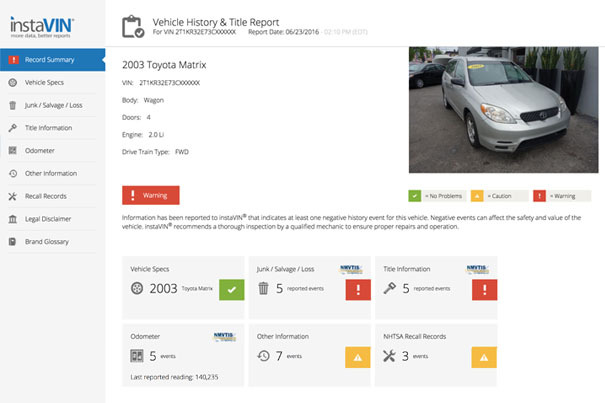 The resulting VIN number lookup report will be mailed to you, and may not include all of the information available from an online vehicle history report. Some states allow residents to order VIN number checks by mail. 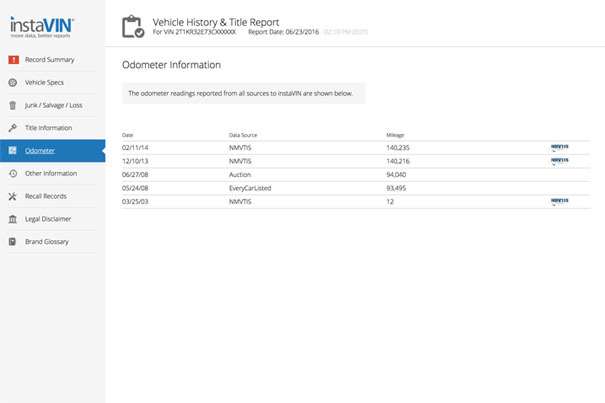 This is the slowest way to get your vehicle history information, and is only suitable for car owners who are in no hurry to get their results. (For quick and easy access to your VIN report, order online now!) Before attempting to order by mail, you will need to contact your state’s DMV for details and instructions on what form to use, where to send your request and what methods of payment are acceptable. What info is in a VIN history report? Why would I need to perform a VIN check? There are many benefits to checking VIN numbers. If you are considering purchasing a vehicle, looking up the VIN can help you ensure that it is not stolen, and that its title is clean. 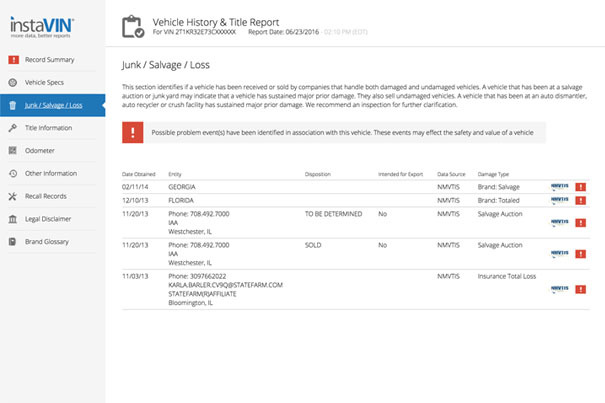 It will alert you if the title is marked by any brands that may prevent you from registering, insuring, operating or reselling the vehicle, such as salvage or junk titles. It can also bring to your attention safety issues, of which you would not otherwise be aware. Title errors that might prevent you from selling or transferring ownership of the vehicle. If you own a standard passenger vehicle, such as a car or truck, your vehicle’s VIN number is required by law to be clearly displayed in several places. It will be plainly listed on your vehicle title, and is usually noted on your registration sticker, as well. The easiest place to check for your VIN number, however, is directly on your vehicle. Most VIN numbers are inscribed in the dashboard, and are clearly visible by anyone standing outside the vehicle near the windshield pillar on the driver’s side of the car. Alternatively, some vehicles have VIN numbers marked on the inside of the driver’s door, where it latches when closed.